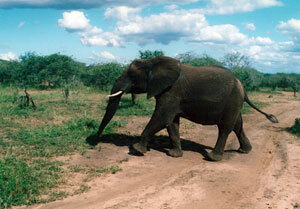 Elephants have the right of way in South Africa’s many parks and game farms. Looking for unusual destinations, with an itinerary tailored to your personal interests? Here's one we found in far-away South Africa, with one of the area's great safari guides. Peter Ginn is a true man for all seasons: lecturer, naturalist, world-class photographer, one-time diamond prospector for De Beers, and more recently a safari guide and author/editor of The Complete Book of Southern African Birds. His elegant, sumptuous, door-stopper of a book is widely viewed as the most comprehensive, scholarly volume of bird photographs ever assembled in this prolific corner of the world. The region boasts an astonishing mix of birds and animals, unusual plant life and interesting geological features, and there is hardly a part of God's creation that lies outside Ginn's intimate knowledge. A South African by birth, for much of his adult life Peter lived in Zimbabwe, dividing his time among teaching geography and science at Peterhouse School in Marondera, writing about and photographing birds, and leading safaris for ornithologists from around the world. He pursued these latter interests as far afield as Victoria Falls in the westernmost corner of the country, and well beyond its borders into Botswana, Namibia, Swaziland, Madagascar and his old homeland of South Africa. Two years ago, after the pendulum's swing away from apartheid in the south was matched by a sudden rise of race-based nationalism in the north, he and his wife Liz returned their native land. They settled in the seaside town of George, just east of Cape Agulhas, the continent's southernmost point. But other than the new address, little has changed in the way he makes his living. He continues to plan personalized tours for small groups wishing to visit southern Africa. These trips can be arranged as self-drive trips or a courier plus mini-bus or a professional guide. Ginn is a registered guide in all nine of South Africa's provinces. 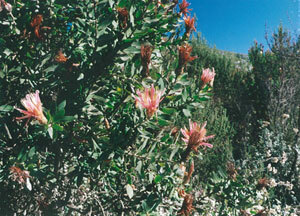 More varieties of Protea (250) grow in South Africac than any other place on earth. He and Liz settled in this area because it offers the unique Cape Floral Kingdom, smallest of its kind but with an incredible variety of endemic plant species of which the best known are probably the colorful Ptoteas. This supports a number of unique endemic bird species as well. A wide choice of habitats such as sub-tropical rain forest, coastal zone, Fynbos, Succulent Karoo and Great Karoo ensure a variety of bird and animals. By design, most of his safari groups are small - typically 3 or 4 couples - and most members know each other before they get together for the adventure. Friends are more likely to be compatible, and this size group permits maximum economy on his guiding fee, vehicle rental and gas costs. Ginn doesn't object to solo participants, but single supplements tend to be expensive so whenever practical he recommends that individuals share a room – as all places offer some rooms with single beds. Because southern Africa is so far from just about anywhere, travelers should allow enough time to warrant the trip and to experience a reasonable number of habitats and to get the most out of the regions astonishingly rich and varied natural wonders. Most of Ginn's safaris are at least 14 days, and can be designed for 16, 18 or longer. He prefers that the group arrive together; if anyone wants to go elsewhere they do this after the end of the tour. He is licensed to guide in all South African provinces, so if the whole group would like to go on to somewhere like Kruger or Victoria Falls, he can organize and guide that as well. The design of a tailored tour is based on several criteria. An obvious motive for birders is to add to their life list of sightings. Ginn is a living library of avian identities, including calls and songs, and it's not unusual for first-timers to add 200 or more new species on a single safari. And of course, in many national parks and new safari farms there are the wild animals: rhino, elephant, Cape buffalo, hippo, zebra, giraffe, lion, leopard, antelope, kudu, baboon, monkey - the list seems endless. But whatever its primary focus, to get the most out of the trip a group should have a wider interest than just looking at birds or big game. "I like to organize visits to scenic sites, villages and working farms as well as the obvious parks and nature reserves," Ginn says. "It's a way of learning about the area and meeting its people with far more intimacy than is possible with larger groups or more rigid itineraries." He also designs the trip to assure a variety of habitats and scenery. connects the verdant coastlands with the arid plains to the north. Groups usually start their tours at either George or Cape Town - both served by South African Airways. 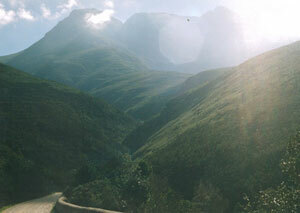 George offers coastal and mountain scenery; major habitats are the Fynbos and sub-tropical Forest. To the north, Little Karoo is known for its spectacular scenery and abundant plant life – if the timing is right, he can arrange a private visit to the isolated Kamanassie Reserve. Red Stone Hills at the feet of the mighty Swartberg range are reminiscent of Sedona, Arizona. Further north is semi-arid Great Karoo, with its antelope such as Springbok and the comparatively rare Mountain Zebra in the Karoo National Park at Beaufort West. The area is noted for its wool-producing merino sheep which thrive on the succulent shrubs. Beyond that lie the white sand dunes of Witsand Nature Reserve , known to "growl" in the proper wind. Moving westward, we reach the Agulhas plain; its bottommost point, Cape Agulhas, is where Africa ends and the Indian Ocean meets the South Atlantic. 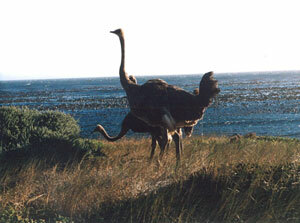 Wild ostriches at the Cape of Good Hope. Further west are the strange rock formations of Cederberg and West Coast National Park with a wealth of interesting birds. Namaqualand usually flowers September to early November, depending on the winter rains. Stellenbosch, in the heart of South Africa's winelands, is a favorite finale, not only because it is so hospitable and scenic (we recommend the Rosenview B&B - colorful, idyllic, surprisingly affordable), but also because this historic area offers a convenient base for exploring the delights of Cape Town, Table Mountain, and the dramatic Cape Peninsula. Except for breakfasts at a B&B, the above prices don't include meals. Food is reasonable in South Africa - probably below comparable offerings in America - but of course the cost depends on where, what, and how much you eat and drink. Accommodation costs can vary as well. The other big price item is transportation. A round-trip coach ticket from New York is usually around $1,200, but bargains reward the patient seeker. Iberia, for example, offers round trips JFK-Johannesburg for as low as $500, with conditions and limits. South African Airways and a couple of smaller carriers offer frequent, convenient and low-cost connections from New York or Atlanta to Johannesburg or Cape Town, with easy, frequent connections to George. Interested? For more information, e-mail Perter Ginn at pgbs@cyberperk.co.za or visit his web site at www.safari-tours.com. You can also call or FAX him from the US at 011-27-44-874-6372 (just remember the 7 hour time difference from the east coast - and 9 hours from Pacific time.) His mailing address is Peter Ginn Bird Safaris, 1 Koer Avenue, George 6529. Republic of South Africa.